African physicists build the first laser with a beam that can be controlled and shaped digitally. Lasers are one of the emblematic technologies of the modern world. The chances are that most readers will be less than a metre away from a laser of some kind as they read this. Lasers fill our world. In principle, they are simple devices. They consist of a couple of mirrors, a source of energy, usually light, and a lasing cavity in which the light can bounce back and forth. The trick is to fill the lasing cavity with a material known as a gain medium which amplifies at a specific frequency when stimulated by light of another frequency. When this amplified light is directed out of the cavity, using a half-mirror, it forms a narrow beam of coherent light of a single specific frequency–a laser beam. For many applications, the shape of this beam– the way the light intensity varies across the beam–is important. Physicists currently change the shape by placing various kinds of beam-shaping devices in front of the laser. These include lenses, mirrors and digital holograms generated using spatial light modulators. 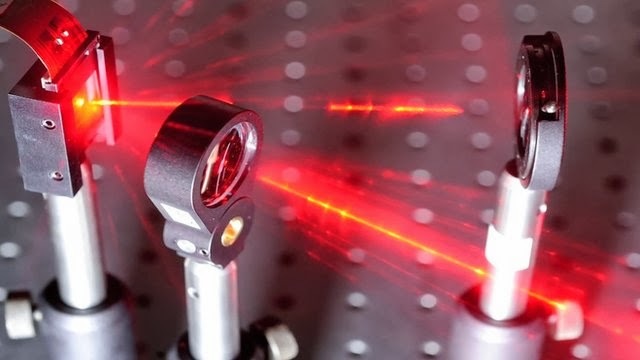 But because these devices are essentially bolted on to the front of a laser, they all require expensive custom optics that have to be calibrated each time they are changed. Today, however, Sandile Ngcobo at the University of KwaZulu–Natal in South Africa and few buddies say they’ve worked out a way round this. And they’ve designed and built a device to test their idea. The solution is simple. Instead of putting a spatial light modulator in front of the laser, they’ve built one in to the device, where it acts as the mirror at one end of the cavity. In this way, the spatial light modulator shapes the beam as it is being amplified. The result is that the beam is already shaped in the required way when it emerges from the laser cavity. “We have demonstrated a novel digital laser that allows arbitrary intra-cavity laser beam shaping to be executed on the fly,” say Ngcobo and co. The big advantage of all this is that the spatial light modulator generates patterns electronically. That allows these guys to change the beam shape at the touch of a button and without any of the time-consuming set up required with other methods. They call their device a digital laser, because the beam can be shaped electronically with a computer. That’s the first time such a machine has been built. The results are interesting. In putting the digital laser though its paces, they’ve shown how it can produce all kinds of beams with different shapes. The applications are many. It will make various kinds of technologies much simpler, such as holographic laser tweezers and controlling aberrations in real time. Impressive stuff!